In 2004, Hope Ann Greggory became an American hero after winning the bronze medal for the women’s gymnastics team. Today, she’s living in her father’s basement in her small hometown—washed up, largely forgotten, and embittered. Stuck in her past glory, Hope is forced to reassess her life when a promising young gymnast who idolizes her threatens her local celebrity status. Will she mentor the adoring, hopeful protégé, take her down, or both? Director Bryan Buckley, whose short film Krug played at the 2004 Sundance Film Festival, returns with his hilariously raunchy feature-film debut. Teaming with co-writer and lead actor of the film Melissa Rauch, they create a lovably loathsome character who makes Tonya Harding look like Grace Kelly. Featuring a star-making performance by Rauch, unforgettable scenes, and many quotable lines, The Bronze is comedy gold. Deadline.com — In addition to returning in his Bucky Barnes/The Winter Soldier character in Captain America 3, Sebastian Stan has been set for two strong roles. On the heels of wrapping the Duplass brothers’ film The Bronze, he will play NASA scientist Dr. Chris Beck in Ridley Scott’s The Martian co-starring Matt Damon, Jessica Chastain, Chiwetel Ejoifor, Jeff Daniels and Kristen Wiig, a film based off of the pioneering e-book and bestselling novel by Andy Weir. Stan has also just been set to play Joshua, the estranged son to Meryl Streep’s rocker mom, in the Jonathan Demme-directed Ricki And The Flash at TriStar. Written by Diablo Cody, the film also stars Kevin Kline and Rick Springfield. Then it’s back to Captain America 3. EW.com — The cast of The Martian is getting even starrier: EW has exclusively confirmed that Chiwetel Ejiofor, Sebastian Stan, and Mackenzie Davis are the latest to join in director Ridley Scott’s The Martian, due in theaters November 2015. They join previously announced cast members Matt Damon, Jessica Chastain, Kristen Wiig, Kate Mara, Sean Bean, Donald Glover, Michael Pena and Jeff Daniels. Production begins in November in Budapest. Today, marks Sebastian’s thirty second birthday! So, with that said I would like to wish Sebastian the warmest of birthday wishes and hope he has a wonderful birthday. Happy Birthday Sebastian! HollywoodReporter.com — Sony Pictures Worldwide Acquisitions has picked up The Bronze, a comedy starring and co-written by The Big Bang Theory actress Melissa Rauch. Jay and Mark Duplass, the brothers behind comedies such as Jeff, Who Lives at Home and Cyrus, are exec producing the indie, the cast of which also includes Gary Cole, Silicon Valley star Thomas Middleditch, Captain America: The Winter Soldier actor Sebastian Stan, Saturday Night Live’s Cecily Strong and Haley Lu Richardson. The movie is currently shooting in Ohio under the direction of Bryan Buckley, the award-winning commercial director known for his numerous Super Bowl spots. Tracking-Board.com — Sebastian Stan will star in the indie sci-fi film ARQ. Written by Tony Elliott and directed by Craig David Wallace, the film follows an engineer who has survived the collapse of civilization, and is now reliving the last day of his life over and over again. Sarah Timmons and Christina Piovesan are producing and Peter Block is executive producing for Corvid Pictures. “ARQ” is the first feature film from Elliott, and depending on shooting and release dates, will be either the first or second from Wallace. Elliott’s previous work has been as a story editor and writer for BBC America’s “Orphan Black,” while Wallace created and executive produced the Canadian horror comedy series “Todd & the Book of Pure Evil” (a project which he worked on with Corvid Pictures). Of course, writers and directors often change tonally between projects–just look at Steven Soderbergh–but based on what there is of Wallace and Elliott’s previous work, I think it’s safe to say that “ARQ” will not be aiming for understated. The real draw of the film is Stan, whose career is on an upward slope at the moment, between his roles as Bucky Barnes in the two “Captain America” movies and the Mad Hatter in “Once Upon a Time.” Others may remember him as the troubled son of the Secretary of State in USA’s Sigourney Weaver-led miniseries “Political Animals.” Or, if you’ve got really esoteric taste, you might recognize him from NBC’s predictably short-lived series “Kings.” Basically, Stan has made a career of playing endearingly troubled, slightly crazed characters–which seems like a pretty good fit for a post-apocalyptic engineer stuck in a “Groundhog’s Day” loop. 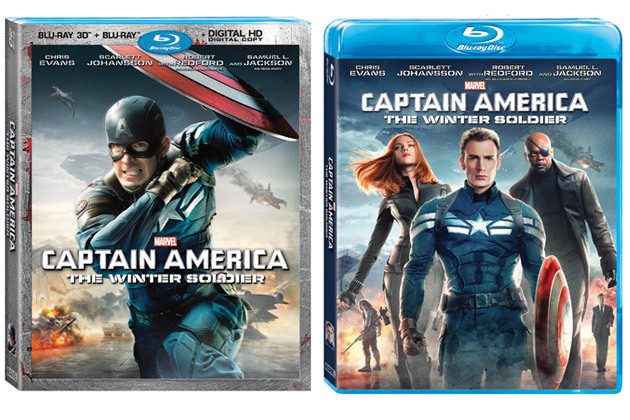 Captain America: The Winter Soldier is coming home to Blu-ray and DVD on September 9th, but will first be available on Digital HD starting August 19th in the states. Folks in the U.K. will actually be able to pick up the Blu-ray and DVD on August 18th, with the digital download arriving as early as August 1st. NewYorkMoves.com — There’s a sense, when you’re watching celebrities on the red carpet at the premiere of their newest blockbuster, that they’re as comfortable in front of screaming legions of fans as they might be sitting on their couch at home. There’s also a sense that they enjoy standing there, squinting under flashing lights and deafened by photographers crying out for their attention–and may even be basking in it. Not so for Sebastian Stan. The evening I spoke to him was also the evening premiere of Captain America: Winter Soldier in LA. Although he was about to take a turn on the red carpet himself, he didn’t seem to know what to feel about the madness about to ensue. From the first play he ever performed in, Sebastian knew that acting would be his calling. Since then he’s made it his business to be a triple threat: acting on television (Political Animals), on stage (he played Hal Carter in William Inge’s Picnic last year), and now stepping up to put his focus on film. When asked if he has a preference for a particular media platform, he pauses thoughtfully before deciding. Flawed? Conflicted? Rich? These adjectives certainly describe several of the characters Sebastian has graced us with – TJ Hammond and Bucky Barnes most definitely included. Not only because of the characters but also the space which they occupy. Concerning TJ, Political Animals followed the life of a prominent political family and all their personal troubles–and how those troubles, TJ’s in particular, followed them into the public spotlight. In this super-sized, extra-large, seriously bloody bumper edition of the Empire Podcast, there are six interviewees. Count ’em, six: Muppets Most Wanted’s Kermit and Miss Piggy, Captain America: The Winter Soldier’s Anthony Mackie and Sebastian Stan, plus Inside No. 9’s Reece Shearsmith and Steve Pemberton. All of this, for free. We’re too good to you, we know. StudioSystemNews.com — While the family crowd turned out in good form this weekend it wasn’t enough to perch the 3D animated musical comedy Rio 2 at the top the box office leaderboard. Instead, Disney’s Marvel superhero movie Captain America: The Winter Soldier kept its place on the pedestal at number one. The ninth installment in the Marvel Cinematic Universe that took the record as April’s biggest opening ever added another $41.4 million to its current $159 million domestic total. It’s worldwide total now stands at $476 million.